Copyright 2012 © The BakeHouse Catering Co. Ltd. All rights Reserved. 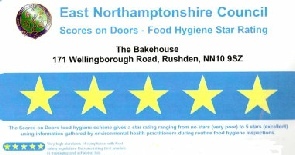 The Bake House in Rushden Was Opened in July 1999 and Has Been a Family Run Business Ever since. The Team at the Bake House Are Proud to Sell Only Quality Products. Most of the over 60 Sandwich/baguette Fillings Are Hand Made on Our Premise, Ensuring Consistency of Quality and Flavour.